Wow! It has beeen WAY too long since I posted anything. Apologies. I have some exciting news! I've made a major decision to further my journey as a trainer by teaming up with Camp Gladiator!! 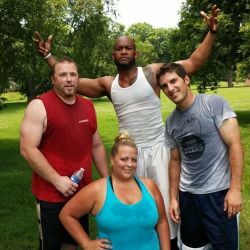 Camp Gladiator is an outdoor group-fitness program that offers four-week boot camp-style workouts! These workouts are challenging and fun and will get you into great shape while you meet positive, like-minded individuals who want to improve their lives. I will be posting information soon about when I'll be starting my camps but right now, I've got a way for you to get started working out with my fellow trainers in the Nashville area NOW for just a fraction of what you would pay for one-on-one training!! RIGHT NOW: You can get unlimited workouts through CG for the rest of the summer for just $69.00 with no obligation after that!!! Click on the "Camp Gladiator" icon on the home page for more info!! !